If you didn't get enough Christmas light viewing from our previous post, here are a few new links and our latest reviews. We travelled to Ogden to see a few new displays. Christmas Village in downtown Ogden was amazing! This was an entirely new concept for us. Rather than a drive through like Fantasy at the Bay, or the Festival of Lights, this is a walk-about. While you're in Ogden, be sure to check out the Harley Davidson shop, and just up the road you can visit All Those Lights. 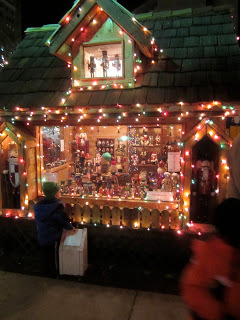 In Salt Lake, check our review of Neff Circle lights, as well as Christmas Street in Sugarhouse. In South Salt Lake Valley, try Christensen & Hymas law firm. Right here in Utah Valley, check out the Sorenson home. There are many more lights to see! Check out our Christmas Activities tab and Christmas Lights tab at Utah Valley Family Adventures! Leave us a comment if you know of anything we're missing!